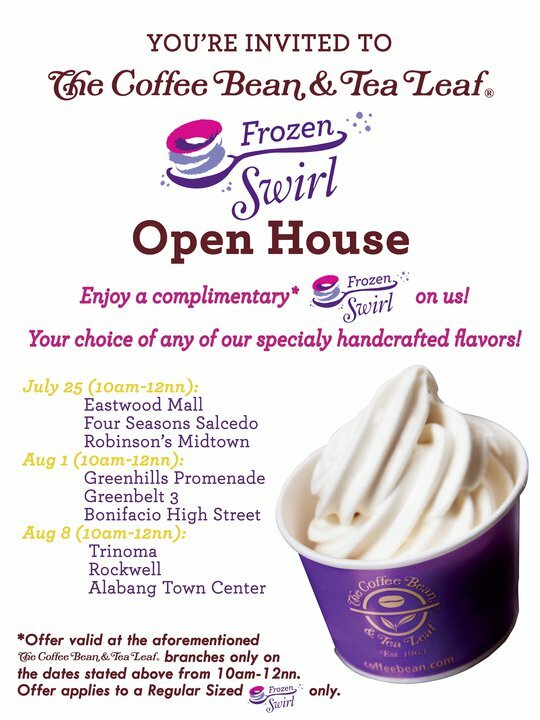 Although I'm used to waking up late due to night law and MBA classes, I specially woke up early just to make it in time for "The Coffee Bean & Tea Leaf Frozen Swirl Open House" at Robinson's Midtown. As a fan of Fro- Yos, I surely can't let this pass. I always claim open house at Robinson's Midtown since the DLSU Library Branch where I frequent does not participate in open houses. Also the crew at Robinson's Midtown branch are very friendly and accomodating. They even exert the extra effort to inform every customer that they have an open house so they could avail of it. Unlike the Ayala Town Center Branch where a couple of my friends visited last open house and they where told that it was already out of stock even though only an hour has passed after the mentioned starting time. I, my sister and my boyfriend didn't know what else would go well with our Frozen Swirls so we just ordered those and nothing else. (with a receipt issued for an amount of 0.00) I ordered Matcha Green Tea while my companions ordered Affogato and Caramel Affogato. My Matcha Green Tea Frozen swirl was made to look like an inward swirl. It tasted similar to Green Tea ice creams. It perfectly hid the sour taste of the yogurt. Every spoonful was a taste of cool flavorful green tea. The Afforgato was plain frozen swirl topped with coffee similar to the way chocolate syrups are topped in ice cream. Every spoonful was sensational as you can feel the icy crisp of coffee and the tingly tangy taste of yogurt combined. My boyfriend ate every spoon with delight until only the concentrated coffee was left at the bottom of the cup. The Caramel Affogato was similar to the Affogato but with an additional caramel syrup for additional sweetness. My mom and my other siblings came to fetch us. We got my mom her favorite Biscotti and a Classic Vanilla Frozen Swirl. It was a plain frozen yogurt that was made to taste like vanilla ice cream. 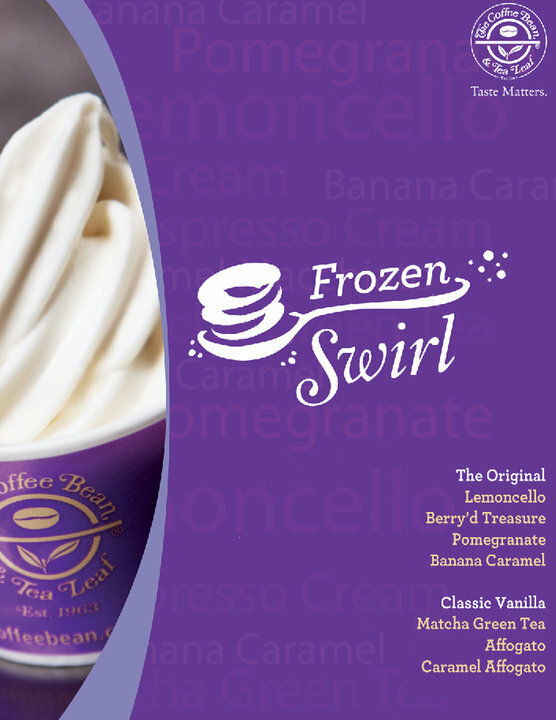 For the rest we ordered Lemoncello, Berry'd Treasure and Pomegrate Frozen Swirls. The Lemoncello was a combination of sour Lemonaide and plain yogurt. The sourness of the Lemonaide overpowers the tangy taste of the yogurt. It tasted similar to a lemon sherbet. The Berry'd Treasure was a perfect mixture of blueberries and more. It tasted berrylicious. I could taste the hint of blueberry the most. The Pomegrate was lightly sweetened and a bit tangy. It was naturally refreshing. Compared to the other brands I've tried such as Red Mango, Califronia Berry, White Hat, White Berry, Fro-Yo, "The Coffee Bean & Tea Leaf Frozen Swirl" is a bit pricey but they compensate this by offering unique flavors from the rest. If you want to try them out for free check out the upcoming schedule for open houses at other areas. Have just recently started watching Mei-Chan to Megane-Chan Japanese Drama. It is about a seemingly nerdy girl named Adachi-Hana striving hard to be a good student. While a yankee stubborn boy Shinagawa Daichi does the exact opposite. So Adachi-Hana, being the Class President, always bothers Daichi to participate in class. Overall, it looks promising. It's not the usual Japanese Drama even though it's in an ordinary High School setting. The characters,as they face their own struggles, are worth watching.